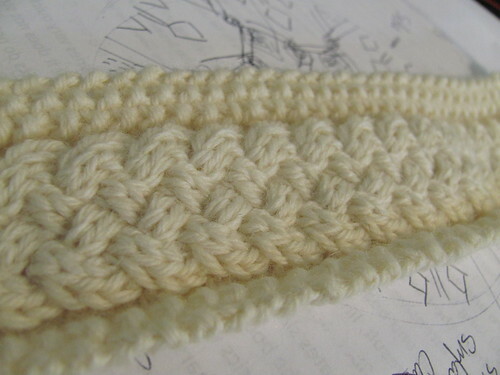 WiP Wednesday: More Master Knitter Swatches, of course. I’m still here – and still plugging away! I’ve got tension issues galore going on. 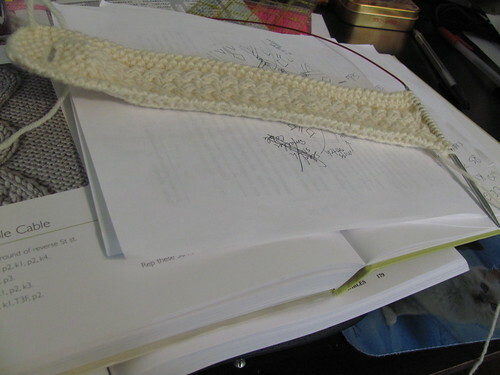 Gutters in my purls, and loose purls after my knits. 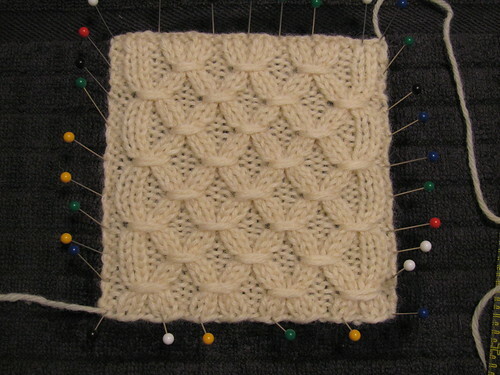 The twisted stitches just accentuate the tension issues, too. I put this one in time out while I concentrated on the other swatches instead. I’m happy with how the hat is going – I just hope I don’t screw it up! Then it’s on to the sweater!! And for written work I just have the one more report to write, and the 4 book/magazine reviews. I may try to tackle those this week as well, or this weekend. So, that’s what I have to show you this week! 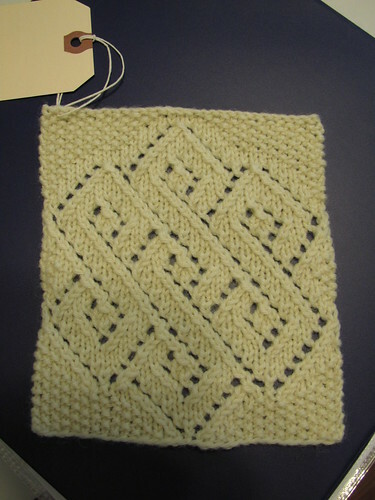 Check out Tami’s Amis for more WiP Wednesday posts! Girl, the brim braid gave me goosebumps! The entrelac looks /amazing/! You shall overcome! lol! 🙂 I knew you’d like the brim braid! I’ll bring it tomorrow night to show you – I’m quite proud of it so far! Aww! 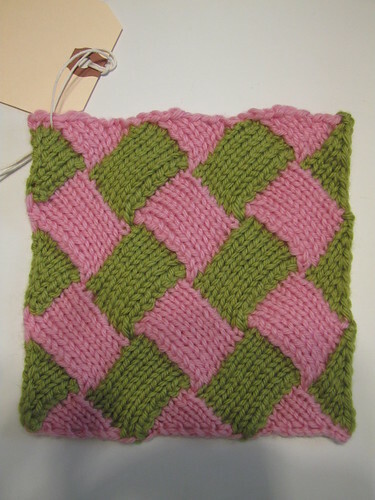 Yeah, entrelac is such a fun pattern! 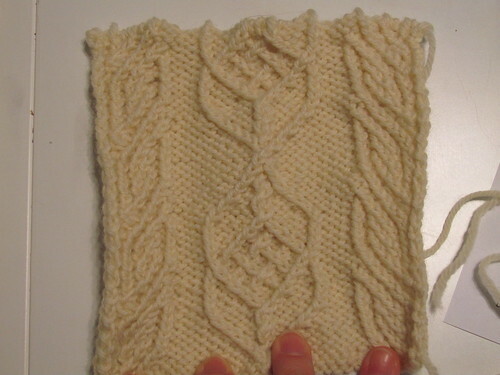 And fun to knit, too! Wow! I can’t believe you are almost finished with your Level 3 swatches, Heather! It seems like you just got your Level 2 binder back. I have had Level 2 printed and ready to start for a couple weeks now but am already bogged down with the first swatches. Finishing seams has never been my favorite thing to do so I’m not surprised that I can’t even get going here. All your swatches are looking lovely, lovely, lovely! 🙂 Thanks Rebecca! I’ve been super motivated – I’m stalling a bit now, though. Good luck with level 2 – you can do it! !